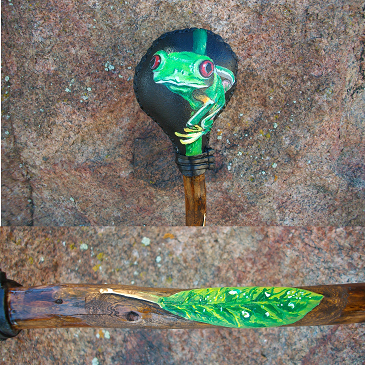 By the artist "Moon Cat", the Tree Frog Rattle embodies the energies of Frog Medicine. Frog is a powerful healer and he teaches us to leap forward in life. Moreover, the Tree Frog teaches us to stay grounded to the Trees and to Mother Earth as we leap from one endeavor to the next. This Rattle is made from rawhide and contains organic corn, selenite and clear quartz crystal within it. 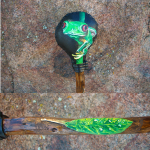 It also has a hand carved and painted leaf into the handle.